Eighty years before Columbus sailed to the Americas the Chinese sent ships out to explore the world. They discovered many wonderful things which they brought back to their country but the most amazing was the Chee-Lin. The only other Chee-Lin to appear in Chinese history happened at the time of Confucius' birth. The Chee-Lin is a mythical animal with the body of a horse, the hooves of a deer and the horns of an ox. The Chee-Lin represents peace and prosperity. This Chee-Lin was a giraffe, a gift from a sultan to a Chinese emperor. This is the story of Tweega, a giraffe and the Chee-Lin. Tweega is 4 months old and eight feet tall when he is captured and taken as a prize to sell to travelers from other countries. He is traded several times and travels to many countries. The story is told from the point of view of Tweega. The people he meets and the places he lives are described by him. Tweega travels from Africa to Arabia, India, Bengal and finally to China where he stays. He will be 3 years old and 14 feet tall before he arrives in China. Tweega is regarded as a marvel of creation in the places he visits. He meets many people, some are kind like the tall boy who whispers in his ear and some are not kind to animals like Salt-Man. Wherever Tweega goes he manages to make friends, like the girl with the apples in her sleeve. Rumford's illustrations are rich and painterly with lots of texture. In an author's note he describes his technique. Each illustration is a a scene out of Tweega's story and corresponds to the text on the opposite page. The text is blocked and framed in borders that reflect the current country or culture of Tweega's journey. This is a nice effect and adds another layer visually to the story. The richness and differences between of all these countries is highlighted. The borders are not done in the style of the illustrations and are varied in style themselves. The illustrations in Chee-Lin are beautiful and the writing is both informative and engaging. The reader wants to know what happens to Tweega and if he's happy. This is an overall satisfying package. There is a map of Tweega's journey and a poem done in calligraphy by Rumford. The story was based on a painting of a giraffe and a poem about the Chee-Lin from the early 1400s. Rumford reproduced the poem on the back of the book jacket in calligraphy. He also provides a translation of the poem in English. This is a great book to introduce world explorers and history to kids. James Rumford is an award winning author and illustrator with high quality and well researched books. He has an interesting and varied body of work. I would recommend reading his other titles if you haven't explored them yet. Visit the Nonfiction Monday roundup at Book Aunt. Photo-Journalist Tony O’Brien and filmmaker Mike Sullivan have collaborated to produce a book of snap shots into the lives of a variety of Afghani children aged 8 – 18. They traveled to Afghanistan and interviewed and photographed a range of children. There are children who live at home with their parents or extended family, and children who are orphans; children who attend school and children who work 15 hours a day; children who help out at the family business and children trying to make a living through pick pocketing. Each child has a unique voice and most have a message they would like to communicate to a child from another country. This book has been selected as one of the ALA notable Children’s Books for Older Readers in 2009. When I started this book, I doubted that typical children who live in the first world would find any similarities with children who live in such dangerous and poor circumstances but by the middle of the book, I realized that the kids in this book are just like the kids I see at work. They draw big pictures and are proud of them, they have a hopeful view of the future that is largely unconstrained by reality, they care fiercely about their families and friends and they have those moments of pure joy that we can only experience as children. This book is concise and a great example of cross cultural communication. The pictures are vivid, the content is interesting and the presentation is fantastic. Text and images work wonderfully together to present a digestible yet challenging slice of life in a country that has been so linked with the western world recently, but that is also, so different. It’s been an honor to read and review this book and to hear the true voices of the children of Afghanistan. Welcome to Week 3 of What My Children Are Reading. I'm really enjoying reading everyone's posts and hope you're finding recommendations for your own children from other participants. One thing I don't talk about a lot is reading things other than books, children's magazines in particular. We read a lot of magazines in our house and subscribe to two children's magazines that we absolutely love. National Geographic Little Kids comes every other month, and it's designed specifically for kids aged 3-6. However, my daughter is only two, and really enjoys this magazine. It's small and full of photographs of baby animals and picture games. I BELIEVE it's in its charter year and hope it's continued and that eventually it will be offered monthly. We also subscribe to Highlights High Five magazine for children aged 2-6. Anyone familiar with Highlights for Kids will notice the familiar puzzles, stories, recipes, crafts, and interactive games, but these are designed for the younger age group. We also check out a lot of different magazines from our library. Our library has a wide variety of back issues of children's magazines, and adult magazines for that matter, available for checkout. Magazines are a great way to introduce kids to reading and are especially good for reluctant readers who may feel intimidated by a bigger book. What about you? Do you read magazines with your kids? What have your kids been reading this week? I am so very very excited to be hosting a huge Harry Potter giveaway at The Well-Read Child! 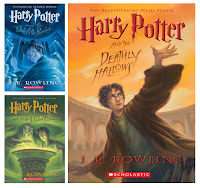 In celebration of the paperback release of the final Harry Potter book, Harry Potter and the Deathly Hallows, Scholastic is giving away books 5, 6, and 7 to FIVE lucky winners. * Book 7 Harry Potter and the Deathly Hallows! Don't miss out on the chance to own the last three books in this absolutely amazing series! 1. Leave a comment below, telling me why you'd like to win this prize pack. Be sure to include an email address or link to your blog so I can contact you for shipping information if you are the winner. 1. Blog about this giveaway and link back to this post. Include your link in the comments. At noon EST July 10, 2009, I will do a random drawing and choose five winners who will receive the prize pack. This is open to residents of the Continental U.S. only. Thanks to Scholastic for offering this wonderful prize pack. Good luck everyone! Welcome to this week's edition of What My Children Are Reading! This week has been an Eric Carle week for us. The Very Hungry Caterpillar was one of the first books we introduced to our daughter when she was just a baby, and two years later, it hasn't lost it's magic with her. The simple story, the colorful tissue paper illustrations, the different foods featured, and the adorable caterpillar make this a winner in our house. We have the board book version, as always, it's the holes the caterpillar chews through the foods that keep my daughter coming back to the book again and again. She can't resist putting the tips of fingers in them and holding the book up to her eyes to look through the holes. It's no wonder this is still a bestseller 40 years after its first publication. Brown Bear, Brown Bear, What Do You See by Bill Martin, Jr. with illustrations by Eric Carle has been another long-time favorite in our house. It sat on the shelf for a while after my daughter learned to identify all of the animals, but now that she's learning her colors, it's a must-read nearly every night. I can't sing enough praises about this book, and we're going to some of the other books, such as Panda Bear, Panda Bear, What Do You See? to our library soon. What have your kids been reading? Leave your link in Mr. Linky below. If you don't have a blog, I'd still love to hear what you're reading with your kids in the comments section. If you're leaving a link, please link back to the post that talks about what your kids are reading instead of your main URL so others can find it easily. Thanks so much to everyone who participated in last's week's first "What My Children Are Reading" meme. It was great to see what everyone's kids are reading. This week, in addition to reading Good Night, Gorilla a million times, my two-year-old daughter and I read these books. You'll probably notice an animal theme. She's totally into animals right now. 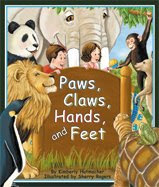 This is a brand new and super-cute touch-and-feel board book featuring a bunch of different animals with touch and feel patches on their bodies. 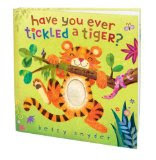 Kids can tickle a furry tiger's, a scaly armadillo, a walrus, and more. This book just arrived from Random House this week, and I think we've read it about 20 times already. My daughter loves to say "goochie-goochie-goo" when she's tickling the animals. The coolest thing is that the book introduces kids to animals they may not have ever heard of. Rhyming couplets on each spread, paired with Betsy Synder's adorable illustrations, make this a book I'd recommend to anyone with a baby or toddler or anyone who's looking for a gift for a kid in that in that age range. Like any cruise, the pairs of animals are excited when they set out on Noah's Ark, but after a few days of around-the-clock rain, they get a little testy. The book goes through the alphabet of animals, using alliteration to describe their state of mind: grumpy giraffes, hysterical hyenas, zoned-out zebras, and so on. 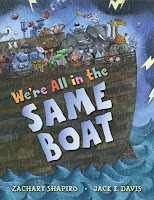 Finally, Noah himself gets testy and proclaims, "We're all in the same boat!" We see a quick change in the animals' attitudes as Shapiro cycles through the alphabet again: the kangaroos play kickball, the foxes tell fables, etc. This is not your typical alphabet book. Kids learn the alphabet and many adjectives and verbs through an entertaining story, but what really makes this book a winner are Jack E. Davis's hilarious illustrations. Every time we read it, I notice something new in the details and chuckle at some of the animals' facial expressions. My daughter is beginning to recognize some letters of the alphabet and has a great time identifying animals, objects, and letters as we read along. In this fantasy story, two kids, a girl and a boy, wake up in the middle of the night and take a journey around the world, visiting a lot of animal habitats: the jungle, the Savannah, the arctic, and the outback. Their bed magically takes them from place to place, and they meet tons of animals along the way. I'm the first to admit that I'm not a fan of rhyming picture books, but this one works and flows nicely. The plethora of animals, habitats, and action verbs along the way make it a great book for learning purposes, but kids won't even realize they're learning. As with all of Sylvan Dell's books, a section in the back features activities and resources for further learning. In our house, my daughter is fascinated by all of Sherry Rogers's animal illustrations, and she loves to see where the bed is going to land next. So, that's what we've been reading this week? What have your kids been reading? Leave your link in Mr. Linky below. If you don't have a blog, I'd still love to hear what you're reading with your kids in the comments section. If you're leaving a link, please link back to the post that talks about what your kids are reading instead of your main URL so others can find it easily. I'd love to hear from even more people today, so please spread the word. Eleven-year-old Aubrey was riding in the car with her family when a tragic accident killed her father and younger sister. Her mother, who was driving the car, was so devastated and depressed that she left Aubrey all alone. When Aubrey's grandmother gets worried because no one is returning her phone calls, she travels from Vermont to Virginia and discovers that Aubrey is living by herself. Aubrey soon moves to Vermont to live with her grandmother and is eventually able to begin healing and dealing with her grief and feelings of abandonment. Love, Aubrey is a beautifully-written novel and filled with heart-wrenching sadness. Aubrey is a believable character who goes through periods of denial, grief, and anger. Her grandmother is an exceptionally strong woman and is instrumental in helping Aubrey recover as is Aubrey's new friend, Bridget, and her guidance counselor, Amy, at the school. Told from Aubrey's point-of-view, readers get an inside look at a child who has suffered a great loss, and I think this would be an excellent book for a child who has experienced a loss in his or her life. It would also be a great book for adults who are helping a child through such a loss. I also think this is the perfect book for a kid who likes heart-wrenching books. I know when I was a child, I would have devoured this book, and even reading it as an adult, I found it inspiring to see how someone, a child nonetheless, dealt with such a devastating loss. I started crying on the first page and didn't stop until the book was finished. Highly recommended, but don't forget your tissues.